The Echinoblog: Tales from the Intertidal! Algae+Snail=Protection from Big Mean Starfish! Tales from the Intertidal! Algae+Snail=Protection from Big Mean Starfish! 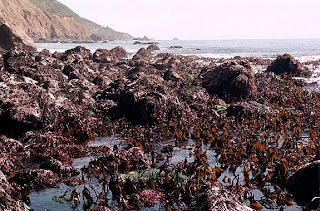 California's rocky intertidal (and subtidal) zone is a wonderous place! A countless host of invertebrates and other organisms co-exist here-a rich ecosystem that is one of the most distinctive and well-studied marine ecosystems in the world. Much of that richness comes from understanding the complex interaction between the species which live here. The various "stories" or natural history that have resulted from the feeding, defense, behavior, and reproduction of MANY species has laid the foundation for well-grounded ecological understanding of the many organisms that live here. Few places in the world have such a well-understood and rich fauna. Here is ONE of those stories! in a 2007 issue of Marine Ecology 28: 480-486-Associational resistance mediates predator-prey interactions in a marine subtidal system. Thornber began with an interest in the ecological effect of epibionts on ecological interactions. Epibionts are organisms that live on the surface of another living organism, so a kind of commensalism. Examples might be barnacles on whales or perhaps the worms and other encrusters on these cidaroid sea urchins. It turns out that there's a pretty neat little example of how epibionts affect an important interaction between the Brown Turban Snail and its sea star predators! Thornber focused on the Brown Turban Snail: Chlorostoma (cited in the paper as Tegula which is a synonym) brunnea. The Brown Turban snail is often covered with different types of crusty or coralline algae that give it a rougher "covered over appearance". This isn't a brown turban snail...but it gives you the general idea.. A full "leaf" of coral is off to the right side.. 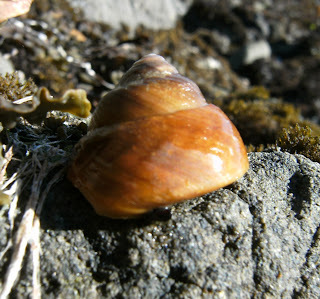 The image below isn't the Brown Turban snail-but it gives you the general idea. Note the red/pink crustose algae at the top! #1-How common is it to find Brown Turban Snail (i.e., C. brunnea) shells covered by algae? and how does this relate to the abundance? 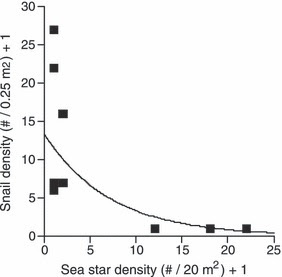 Or in other words does more starfish correlate with MORE or LESS coraline algae on shells ?? #2-Does the presence/absence of algae covering the shell influence feeding preferences of two predatory starfish?? and the shallow-water subtidal sunflower star Pycnopodia helianthoides! 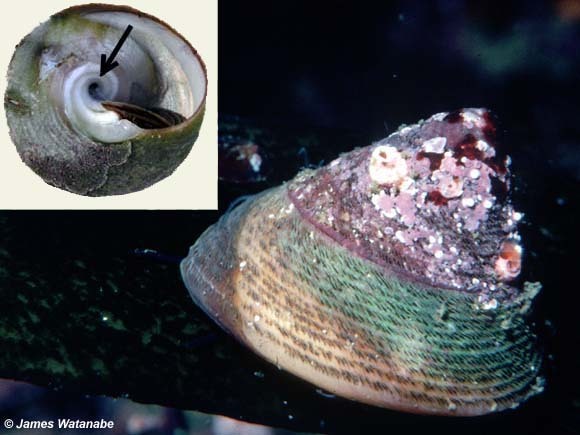 -Apparently >60% of of snails were at least 75% covered with one or more species of crustose algae. A minority of snails (35%) wer completely covered. 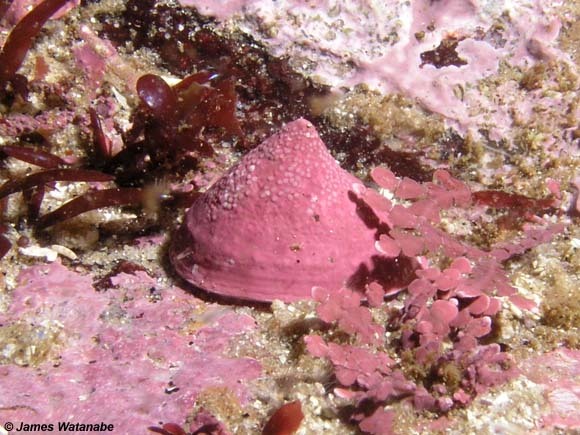 So covering of shells with the red/pink algae is pretty common. Fig. 2 from Thornber's paper shows the correlation of density of Brown Turban snails relative to the density of Pisaster and Pycnopodia. 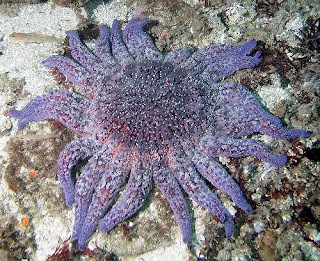 She found that the density of the snails was driven by the abundance of predatory sea stars-specifically Pisaster !! Lab Experiments (2nd question)! How will Pisaster and Pycnopodia feed on algal covered shells?? Based on her Fig. 3, it turns out that shells that LACK any kind of the algae included (coralline and crustose) are the MOST preferred by the two predatory stars tested! 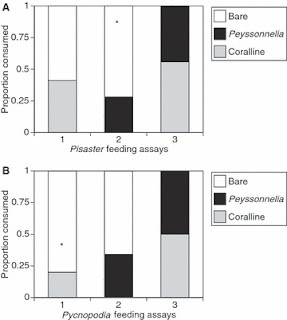 The bar graph below shows the greatest % of C. brunnea was fed upon when the shells were bare. 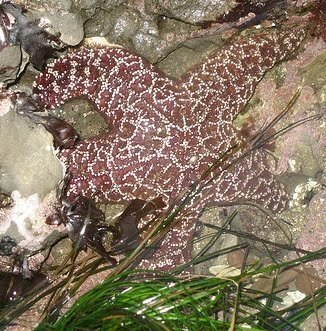 Pisaster ochraceus was nearly THREE times as likely to consume BARE C. brunnea than those covered by algae. Pycnopodia ate FOUR times as many BARE snails as those covered with crustose coralline algae. The results support an interesting idea-the crusty/red algae that is present as an epibiont on the shells seems to discourage predatory starfish from feeding on the snails! 1. The algae may provide camoflage against visual predators, such as crabs, octopus, fish, etc. 2. It is unclear if the distribution of the algae is somehow influenced by the snail or some other non-random factor. 3. What makes the algae so "discouraging" to starfish? Possibly the production of chemical defenses..
Or it could also be that the rough surface itself creates an unpleasant or irritating sensation to Pisaster and/or Pycnopodia. The "mollusk escapes starfish predator" theme is an old one. Its an important ecological interaction that has been at the center of many ecological surveys. clam escapes from sunflower star!